Diary We had been told by people who know about these things that cheetahs usually sit on top of termite mounds which enable them to get a better signal on their mobile phones when they are phoning around to find something to eat “You see any game?” “No, you?” “No” etc etc Obviously signal was strong on our first day (Leopards have been very busy building the masts) as we didn’t spot any but saw lots of lions lying around on their backs wanting a tummy tickle. Had come prepared this time with blindfolds and earplugs for the kids. “Are you sure you wouldn’t like to tickle their tummies Clare?” I asked innocently. “Don’t take the piss” was the polite reply. The weather was surprisingly sunny but the roads were very, very wet and muddy from storms on the previous days. Stopped for lunch and put Tess on the roof with a pair of binoculars as an early warning device. In case any animals wanted to eat our tuna & mayonnaise sandwiches. No takers. Stopped by the Mara river and an AK47 armed park ranger took us to look at hippos and crocodiles. Tess asked “Does your gun shoot tranquiliser darts?” “No, just real bullets” unclipping the magazine and showing her. Polly was absolutely terrified, she really doesn’t like to be too close to hippos and crocs without a TV screen between her and the animals…sensible child really. Elephant stand off. Had to wait for elephants to move off the roads…they were enjoying the muddy roads and making tourists wait! 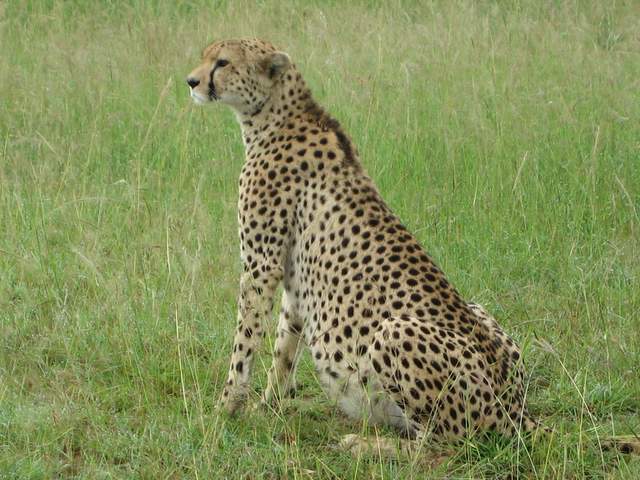 Next day saw a cheetah – “where’s its mobile phone Dad?” She was either heavily pregnant or had been on a diet of 6 pints of Stella Artois a night….